Ownership / Access: Fingal County Council. 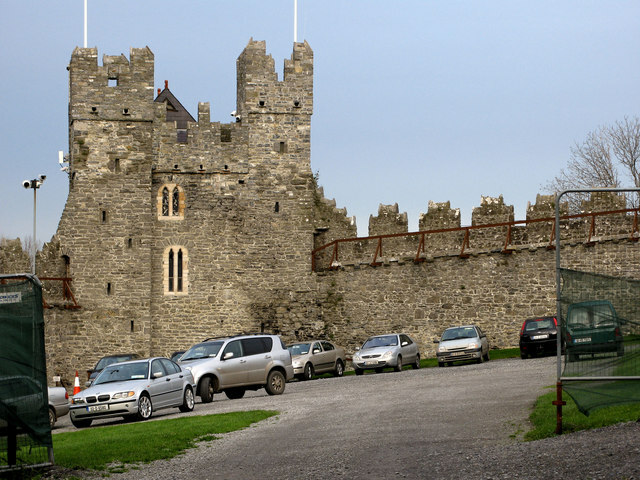 Notes: Swords Castle was built as the manorial residence of the first Anglo-Norman Archbishop of Dublin, John Comyn, around 1200 or a little later in Swords, just north of Dublin. The castle was never strong in the military sense, but is unusual in that the perimeter wall of 305 metres is far larger than normal for an Irish castle. The walls enclose a large pentagonal walled area of nearly 6,000 m² (1.5 acres) with a tower on the north, probably the Constable's residence, and an impressive gateway complex on the south. Within the castle were the Archbishop's apartments, apartments for knights and a banqueting hall. The warder may have occupied the quarters to the left of the gate, while to the right was the janitor's room with the priest's room overhead. The adjoining chapel, built in the late 13th century, was probably used as the Archbishop's private oratory. Other buildings, recorded for an inquisition in 1326, have now vanished, including the great hall on the east side of the enclosure. The Parks Department of Fingal County Council carried out a number of studies, including a conservation study of the entire area, and in 1995 a plan was agreed by the Council for the long term phased restoration of the castle. In 1996 work commenced on the restoration of Constable's Tower, and this was completed in 1998. The restoration of the rest of the castle is still ongoing and when complete, Swords Castle is intended to become a tourist attraction. The newly renovated castle was used as a film location for the production of TV series The Tudors in spring 2010. Swords Castle and Courtyard is open to the public from Monday to Friday by appointment only by calling 00353 (0)1 890 5600.